In the 1970s, concrete was king. Forming technology had advanced fast and Brutalism still seemed like a good idea to a lot of architects (if you remember Newcastle’s ‘Get Carter’ car park or the old Yorkshire Post building in Leeds and wonder what they were thinking, perhaps this article might help: https://www.berkeleysquares.co.uk/2018/02/the-unseen-beauty-of-brutalism/ ). Town planners were falling over themselves to find uses for this apparent wonder material, and one of the most commonly-spotted effects of this cement spread was the appearance of millions of concrete bollards. Choice of street furniture makes a big difference. Car-proof and relatively cheap, they must have seemed like good solutions at the time. The problems have become apparent over the years, however; the squat grey obelisks have a stubborn permanence that doesn’t lend itself well to fast-changing modern cities. They’re not repairable, extremely difficult and expensive to fully remove and replace, and so damaged ones are often left untouched, adding to a sense of decay in often already-deprived areas. 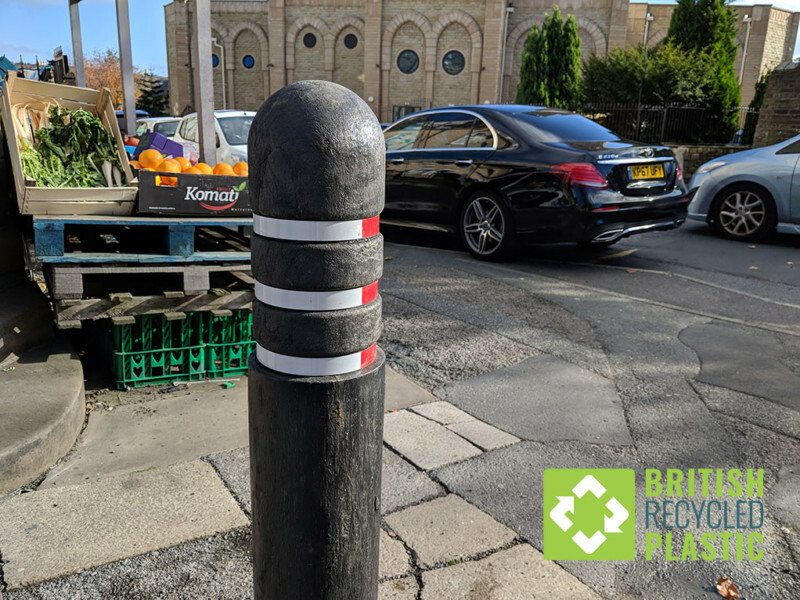 Fortunately, technology and design never sit still, and the modern world has a better solution in the form of recycled plastic bollards. Visually subtler, available in a huge range of forms and colours, easily installed and removed, they can even be locked into sockets in the ground to enable temporary removal when vehicle access is needed. A recycled plastic bollard in Halifax. The final death knell for concrete bollards, at least in the UK, has surely been the introduction of manual handling legislation which places a limit on the weight that can be lifted by human effort alone. The much lighter weight of plastic bollards (usually low enough to be lifted by a single person) means that the machinery necessary for working with concrete is no longer needed. The savings to be had can make a big difference to efficiency-minded councils and contractors. 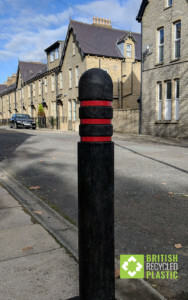 The pictures in this article illustrate a case in point – Halifax council in Yorkshire, England chose bollards from British Recycled Plastic to replace their aging concrete ones, with the effect that their rollout has been many thousands of pounds cheaper than concrete would have been, with no loss of effectiveness. The smaller footprint also helps make sure the often centuries-old footpaths retain as much accessibility as possible for wheelchairs and the like. So they’re prettier, they’re lighter, they’re cheaper, they’re more adaptable, they have a smaller footprint, they’re a great use of waste plastic and can themselves be recycled, and they can’t scrape your unsuspecting shins with evil pebbledash. What’s not to like? 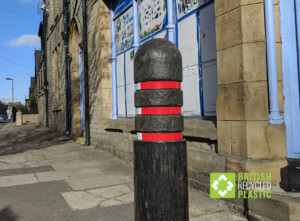 If recycled plastic bollards could work for you, you can find our range at https://britishrecycledplastic.co.uk/recycled-plastic-bollards/. We look forward to hearing from you.